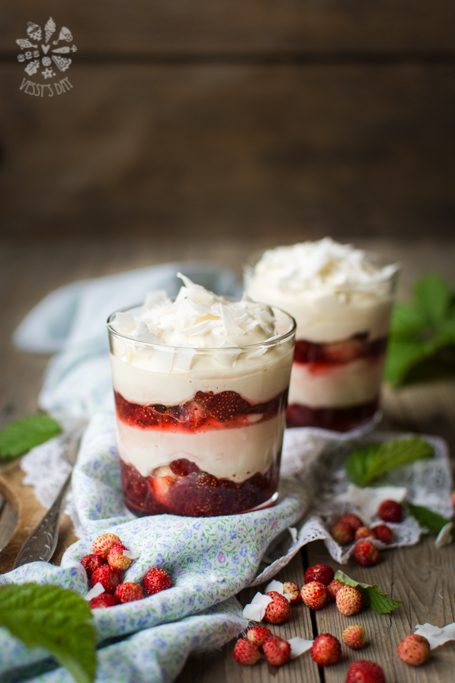 If you are looking for a different, more interesting tiramisu recipe, this is your new favorite recipe – strawberry tiramisu. Recipe calls for cream cheese instead of mascarpone, but if you prefer the creamier texture of the mascarpone, just use that instead of cream cheese. 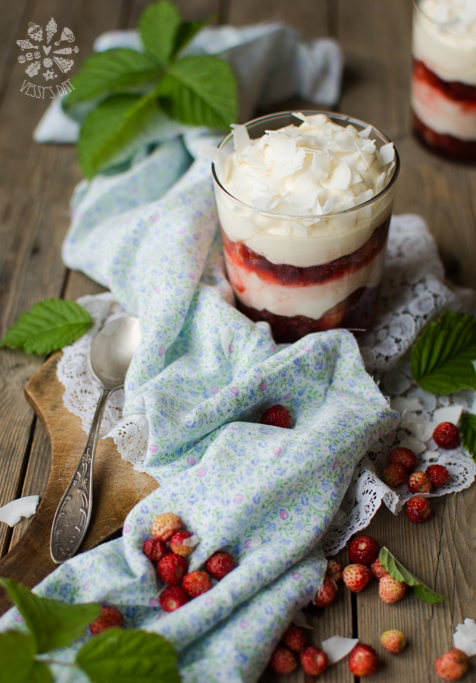 I had some wild strawberries on hand, which I used to make the strawberry coulis, but if you prefer healthier desserts, just wash, clean and puree a few ounces of fresh strawberries, without cooking them with sugar. Here is my recipe for a classic tiramisu, in case you feel like having a bite of mascarpone heaven. First of all prepare the strawberry coulis. Put strawberries in a large bowl. Cover with the sugar, then cover with plastic wrap and put in the fridge overnight. On the next day, remove strawberries from the fridge, put in a medium saucepan and add water. Cook on medium heat until the syrup starts to thicken – about 5-10 minutes. Remove from stove, add citric acid and let it cool completely. You can leave the mixture as it is, with a few pieces of strawberries or puree it finely. ***If you don’t have the time to wait for the strawberries overnight, you can cook them without the marination, but you will have to cook them a bit longer in order for the sauce to thickens. ***If you prefer use puree of fresh strawberries. Prepare the egg yolk mixture: In a medium saucepan whisk the egg yolks and sugar until pale. Add 2 table spoons bourbon and start cooking on medium / medium-low heat (depending on how strong your stove is). Whisk almost constantly until all sugar dissolves and the egg yolk mixture is hot to the touch. Cook egg yolks on medium low heat until you temper them, then you can turn the heat up a bit until the mixture thickens. Make sure to whisk often to avoid curdling the eggs. Once the sugar dissolves and the mixture is thickened, remove from stove and set aside to cool completely as you stir the mixture once in a while. Once the mixture is cold to the touch (or at room temperature) whisk again by hand or with a mixer a minute or so. In a large bowl add the cream cheese and cream and beat with an electric mixer until light and fluffy. Pour the egg yolk mixture into the cream cheese mixture and beat again for a minute just to combine. To prepare a syrup for dipping the ladyfingers: add a couple of table spoons syrup from the strawberry coulis to the water. Dip each ladyfinger into the strawberry water for only 5 seconds. Don’t soak the ladyfingers too much in the water, because they will fall apart. Place the soaked ladyfinger on the bottom of your serving glass or tray. Spread evenly one layer of strawberry coulis, followed by one layer of the cream cheese mixture. Arrange another layer of soaked ladyfingers, top with a layer of the strawberry coulis and a layer of cream cheese mixture. Repeat steps until your dish is full up to the edge. Cover with plastic wrap and put in the fridge for a few hours. Before serving, sprinkle with shredded chocolate, coconut or caramelized nuts.